← Did You Know Americans Actually Speak English Correctly? For patients who no longer have the use of their limbs and torso, life must be navigated through a powered wheelchair – which users often control by blowing into a plastic straw to execute basic functions. 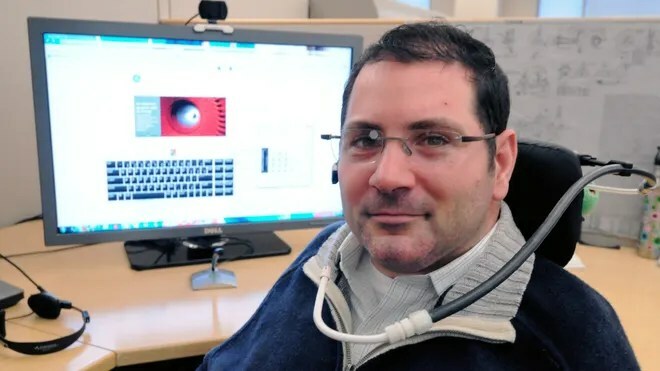 But now, a novel technology may soon allow patients with quadriplegia to better control their wheelchairs by utilizing a surprising new body part: the tongue. 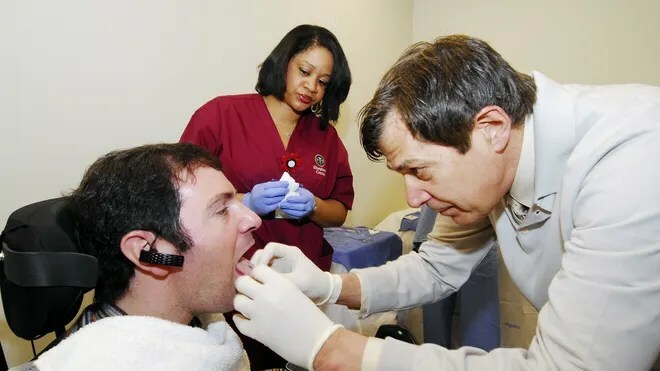 Called the Tongue Drive System, the method involves implanting a magnetic stud into patients’ tongues, allowing them to use the muscle as a joystick for their wheelchairs. Sensors in the stud relay the tongue’s position to a headset placed on the patient’s head, which communicates one of six basic functions for the wheelchair to perform. The system allows users to not only control their wheelchair, but also surf a computer, use a cellphone, turn on a television and much more. Currently, the conventional method used by quadriplegic patients for wheelchair control is the sip-and-puff system. Through a plastic tube mounted on the wheelchair, users either sip or puff air to dictate what they want the chair to do. However, the sip-and-puff system can only execute four basic commands, and many patients feel it can be cumbersome and awkward. “The problem with the sip-and-puff system – even though it’s low cost and easy to use – it’s very slow. It works like a Morse code; you have to enter these commands in a series,” Ghovanloo said. “…It’s also mounted on the wheelchair, so when a patient is transferred from wheelchair to wheelchair or from wheelchair to bed, it needs to be transferred with them, or they need another one set up there. To showcase the benefits of the Tongue Drive System, Ghovanloo has teamed up with scientists from the Shepherd Center in Atlanta and the Rehabilitation Center Institute in Chicago, in order to test the technology on quadriplegic patients at the rehabilitation center. In earlier clinical trials, the researchers tested a removable version of the magnetic stud, which was attached to the tongue through an adhesive. However, the adhesive was only temporary and had to be reapplied every one to two hours. But in the most recent trial, published Nov. 27 in the journal Science Translational Medicine, researchers experimented with a more permanent option, by implanting the magnetic stud through a piercing in the tongue. Jason DiSanto was the first of 11 quadrapleigic patients to get his tongue pierced in order to test the new technology. DiSanto has worked at the Shepherd Center since 2009, after a diving accident left him paralyzed from the neck down. He said that he is excited about Ghovanloo’s system, as his current system can be difficult to manage. 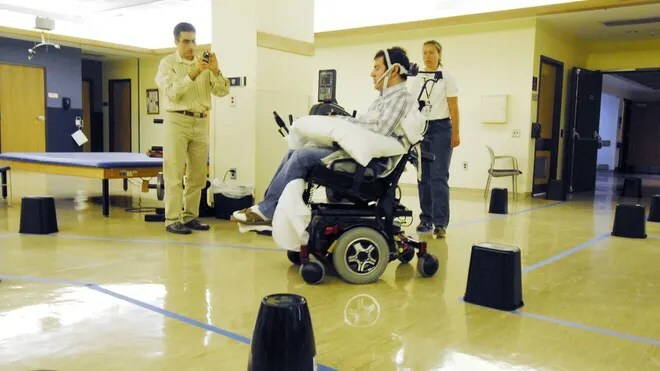 The research team had the subjects perform a set of tasks in a controlled hospital environment, including driving a wheelchair through a course, moving a cursor on a computer screen, operating a cellphone and more. A control group of able-bodied study participants also had the tongue stud implanted and were required to perform the tests as well. The experiments were repeated over five weeks for the control group and over six weeks for the quadriplegic group. For the first time, the researchers showed that the patients with quadriplegia could maneuver their chairs much more easily and much faster with the Tongue Drive System than with the sip-and-puff system. While the Tongue Drive System still requires regulatory approval, Ghovanloo has created a startup company called Bionic Sciences in order to move the technology forward. He has also teamed up with DiSanto, who has worked as an electrical engineer for 17 years, to develop a more internal tongue control system – one that replaces the outside headgear with a sensor-filled retainer that can fit inside the mouth. DiSanto said he is excited for the future of this technology, hoping that one day he can utilize it outside of the hospital and incorporate it into his daily routine.